ODESSA, Ukraine -- Members of American rock group Bloodhound Gang, barred from Russia after a band member shoved its flag into his underpants on stage, could face criminal charges in Ukraine after a video showed him urinating on its flag. 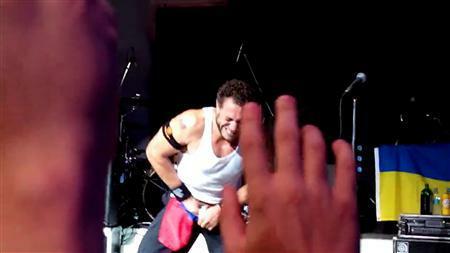 Bassist Jared Hasselhoff of the rock group Bloodhound Gang is seen pushing the Russian white-blue-red tricolour flag into the front of his pants during a concert in the city of Odessa July 31, 2013, in this still image taken from amateur video. According to a text accompanying a YouTube video, bassist Jared Hasselhoff performed the stunt during a concert in Kiev on July 30, one day before the Russian flag incident. Kiev police said in a statement they had been informed about the incident on Monday and described Hasselhoff's actions as showing disrespect for the Ukrainian people. The police said they had launched an investigation, classifying the way the flag had been used as "hooliganism" and an "outrage against state symbols". A spokeswoman for Ukraine's Foreign Ministry described both flag stunts as "unacceptable". "Such actions involving the desecration of state symbols cannot be justified by (their intended) shock value," she said. Russia last week barred Bloodhound Gang, which is known for its sexually explicit songs and on-stage antics, from performing at a festival in the Krasnodar region by the Black Sea. The band could also face criminal charges in Russia and a member of the upper house, the Federation Council, has called for the band's members not to be allowed to return to Russia.